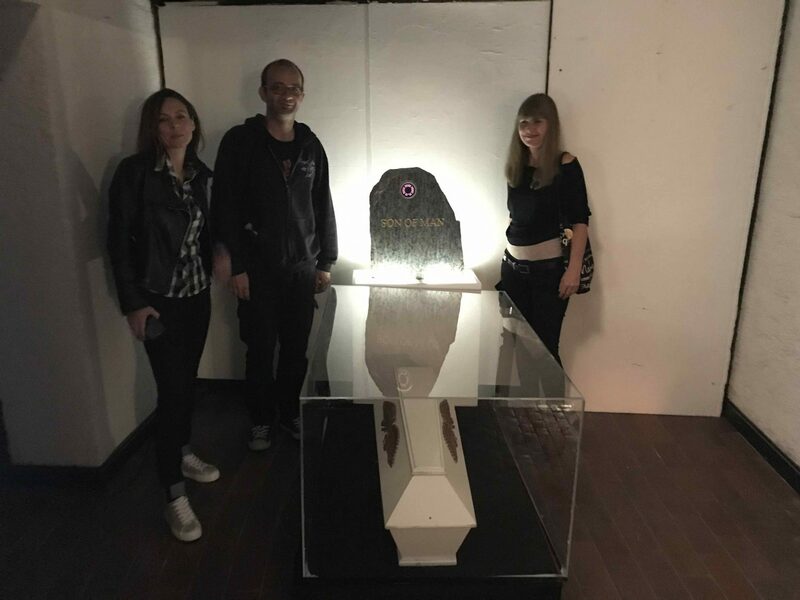 Within the gallery space the authors are creating an installation which represents a conceptual tomb equipped with a camera and microphone integrated into the tombstone. The camera is connected to an Arduino sensor, which the visitors trigger by approaching. Thus, the secret video recording is started, which changes the visitor or current action into a video recording. The recording is limited to one minute. With the help of a computer program the video is automatically edited and cut to a certain time limit. All collected videos (database collects the recordings taken during the span of a day) are automatically posted on the twitter account of the person on the tombstone. Projector with the twits to be posted is also placed in the gallery space, but separated from the installation. The purpose of the installation is to warn the public from the bizarreness, pointlessness and also abuse of social media; from the exchanges of identity, false profiles, hate speech and possibilities of abuse. A while ago, when the Funeral Home Maribor introduced the possibilities of a digital tombstone on Pobreško cemetary there was a lot of public outrage; while no one is outraged by the fact that a lot of FB users are using fake profiles, to sew hate speech and xenophobia. The authors are trying to intervene in the discourse of the usability of social media by creating a profile of a modern deceased who tweets from the grave.